There are many reasons to celebrate real estate ownership in the communities served by The Premier Property Group—luxury coastal living, world‐renowned beaches, award‐winning dining and entertainment districts and an abundance of outdoor recreation just to name a few. It’s a lifestyle many aspire to attain. In truth, the wide and growing appeal of the Emerald Coast continues drawing record tourism numbers, driving economic growth and ensuring real estate investments prove sound and profitable for the long term. For instance, South Walton communities alone benefited from a whopping $4.4 billion total economic impact from tourism in 2017. Visitors create more than 22,000 jobs in South Walton and save households an average of $1,070 by absorbing more than 65 percent of the region’s tax bill. In similar fashion, property owners in Okaloosa County save $1,535 in property taxes through the region’s strong tourism economy. · 3.5 percent increase in average daily rate (ADR). Performance projections for the next six months include a 6.3 percent increase in occupancy with a 0.4 percent increase in ADR. Notably, visitor numbers in South Walton have grown from 3.2 million in 2015 to 4.1 million 2017. 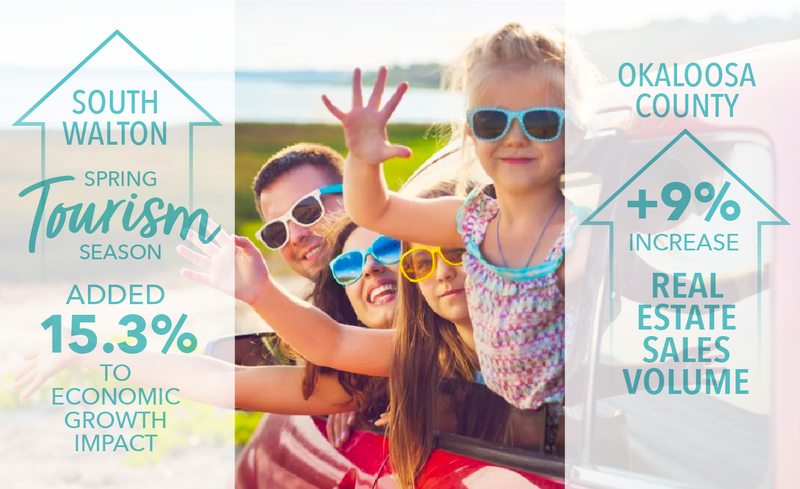 A healthy tourism market coupled with other key economic growth factors across the Emerald Coast also contributes to stable and growing real estate market. Statistics from the Emerald Coast Association of Realtors reveal strong performance in Okaloosa and Walton Counties for 2017 and a good outlook for 2018. In Okaloosa County, 2017 closings were up 7 percent for single family homes and 13.5 percent for condos/townhomes. And growth shows no signs of slowing in 2018—up 9 percent for single family homes and 7 percent for condos/townhomes through second quarter. Walton County numbers reflect similar growth. In 2017, closings for single family homes rose 8 percent, and 2018 numbers reflect 5 percent growth through second quarter. Condos/townhomes were up 13 percent in 2017 and 12 percent for the 2018 reporting period. The Central Panhandle Association of Realtors—covering Bay, Washington, Calhoun, Holmes and Jackson counties —reports a 7.4 percent increase in closings for single family homes through August 2018 and 16.1 percent increase for condos/townhomes through August 2018. Bottom line: it’s a good time to own real estate in the communities served by The Premier Property Group.